Yes, I’m still alive…and I do plan on creating a proper post over the weekend. Has good memory. I’ve been afraid to use a 100% cotton because it could stretch out and grow while wearing it, but tell me if I’m wrong! So whaddya think? 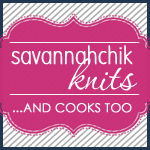 Let me know and I’ll be back over the weekend to share what I’ve been working on (although I should warn you that it’s been mostly work and little play knit). I got most of my summer yarns from http://www.elann.com. I look for 50% cotton/50% acrylic and have never been disappointed. No stretching or shrinking. Pretty soon more of them will come up on the site as spring approaches. 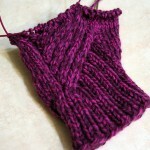 I like the DK wt yarns knit at 5.5 sts per inch so they’re not too heavy. I’m in love with blue sky cotton. I like a cotton blend as well. Rowan Calmer has the gauge you are looking for. 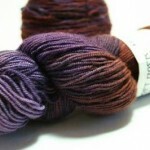 Also, check out the cotton/acrylic DK yarns at http://www.kraemeryarnshop.com/index.cfm. I’m currently in deep, deep love with this yarn! I like this Skacel Polo. I second Chris … Brown Sheep Cotton Fleece is a wonderful yarn. Great to work with, loads of colors, and machine wash and dryable. I’ve never actually used this, but what about Rowan wool cotton? The wool content should help it keep shape. i’m also a big fan of brown sheep cotton fleece, they have DK weight, too. it is really a lovely yarn. so easy to work with. and i’ve used for two projects already! I love Cotton Fleece. I have not used it for cables, but I did use it for an adult sweater and a couple of baby sweaters and it kept its shape nicely. I knit mine to 21 sts/4 in — 1/4 stitch/in tighter than recommended and I like that gauge much better than 20 sts/4in. What a difference something so small can make!! Cotton Fleece also has a GREAT color range. 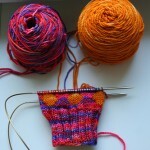 http://www.yarn.com/yarns-knitting/valleyYarns-longmeadow.html. I am planning on buying some to swatch in about a week or so… If I remember, I’ll let you know what I think. Nay blend of less than 80% cotton. Rowan Wool Cottan, All Season Cotton, or Calmer. Cestari Cotton Blend or Silk Blend. Brown Sheep Cotton Fleece. And of course my favorite was LB Cotton Ease. You might want to try Knitpicks Shine or Debbie Bliss’s Cotton Cashmere & Cathay (a little smaller gauge). What about the RYC yarns? The Cashcotton is really nice! I do love the Rowan Wool Cotton, but it knits at a bit smaller gauge. Goddess yarns has some nice cotton blends, as well. I’ve used Rowan wool/cotton and loved it. The colors are sophisticated. I’ve used Rowan Calmer and it has a lot of good stretch to it. I saw someone knitting with WEBS new Longmeadow this morning, same fiber composition as Calmer, but not as stretchy. The longmeadow was looking good knit up, but I have no idea how it’ll wear. Like some of the above, something Rowan. Hard for me to decide – I like so many of them. Wool cotton was my first thought. I also like Jaeger Trinity/Sienna. I knit the Tivoli tee with Tahki Willow (66% linen, 34% cotton) on US7’s, instead of the recommended US8’s, so my gauge was 5 st/1″. I loved working with the yarn, it’s soft yet crisp, and is softens and blooms in the wash and it is good to dry in a HOT dryer to get the linen fluffy. It’s a great yarn for the hot summer days. Rowan Calmer is possibly my favorite yarn ever. 5 st/inch, nice stretch and drape, fabulously soft, gorgeous colors. If it was even a little bit less expensive, I might do nothing other than knit myself Calmer sweaters. Cascade Sierra. 5 st/in. 80% cotton/20% wool. Lots of colors! Rowan Wool Cotton has great colors, I loved knitting with it, but it is HOT!!! I’m coming out of lurking to recommend SWTC’s bamboo. Made a cami out of it, now I want about five more. I do love Rowan Calmer and I’d use it again and again and again, but it does split so you have to be careful. Debbie Bliss Cathay is also a beautiful yarn with very defined stitch. Definitely Calmer. A friend alerted me to a new WEBS offering that looks promising too — and far less expensive. It’s called Longmeadow (http://www.yarn.com/yarns-knitting/valleyYarns-longmeadow.html). Who knows, may be worth a try. I’m also curious to try GGH’s Aran and worsted weight cotton microfiber blends (Samoa and Bali). I haven’t tried either of them, but I’m getting some Plymouth DK wildflower in the mail soon to make a cami. I also looked into Dale Svale. Cotton, viscose and silk in good colors. I like them both because they had nice color pallettes. I don’t like knitting with anything cotton, so I would use something like Elsebeth Lavold’s silky wool. Calmer. Definitely has sproing and you can’t beat Rowan’s palette.